Premium Compatible Label Tapes for the Dymo LabelWriter 320 printer. Compatible Dymo S0722400 99012 White Large Address labels 36mm x 89mm. 5 Rolls x 260 Labels. Compatible Dymo 11356 S0722560 White 89mm x 41mm labels. Compatible Dymo 99014 S0722430 White 54mm x 101mm labels. Compatible Dymo 99015 S0722440 White Labels; 54mm x 70mm. 10 x 320 Labels. Compatible Dymo 11352 S0722520 White Labels 25 x 54mm. 10 x Rolls 500 Labels. Compatible Dymo 11355 S0722550 White labels; 19mm x 51mm. 5 x 500 Labels. Compatible Dymo 11353 S0722530 White labels 13mm x 25mm. 5 x 1000 Labels. The Dymo LabelWriter 320 is a monochrome label writer that can print at the rate of 16 labels per minute approximately and with a printing resolution of 300 dpi. It uses direct thermal technology and is ideal for small as well as busy offices. The Dymo LabelWriter 320 label printer has the capability of handling more than 17 label sizes and media as wide as 59 mm. It can print labels for folders, videos, shipping, addresses, cassettes and name badges also. It lacks Wi-fi connectivity but can be easily shared over a network. This label printer has a label exit and the installation of Dymo LabelWriter 320 Label Tapes is quite easy with this printer. This label printer is very good at delivering clip arts and images and not just numbers, letters and symbols. It also consists of a USB port and is compatible with Windows and Mac computers. It uses black and white Dymo LabelWriter 320 Label Tapes as it is monochrome printer. Furthermore, It has an automatic media load type and requires 50/60 Hz of power. Being ideal for small and busy offices, the Dymo LabelWriter 320 uses direct thermal technology for printing. It produces professional and high quality outputs and has a very good printing speed. Although this label printer lacks Wi-fi connectivity, it can be easily shared over a network. This label printer supports barcoding and compatible with Windows and Mac. But it lacks an LCD display and cannot work with batteries. Q. What are the benefits of thermal printing over the ink one? Will it be cheaper if I buy Dymo Labelwriter 320? A. Thermal printing technology gives you the freedom to print one to hundreds of labels on-demand without having to spend on ink or toner which are more expensive. Besides, you would never have to deal with the ink mess or worry about the ink getting exhausted frequently. And, as far as Dymo Labelwriter 320 is concerned, the onetime cost of purchasing this printer will be far more cheaper than frequently having to spend on ink and toner - one time big investment is better than recurring expense on inks and toners. Additionally, the Dymo labelwriter 320 label tapes come with pre-sized labels in a wide variety of shapes and sizes that cuts the cost on label waste and saves time against sheet and label jams. Last but not the least, labelwriters operating with thermal printing offers long-term cost and time savings. Q. What is the material used in the Dymo Labelwriter 320 label tapes? Is it polyester? A. No. The Dymo labelwriter 320 label tapes have paper labels rolled in which meet the standard label quality. The underside of the labels is covered with permanent adhesive. 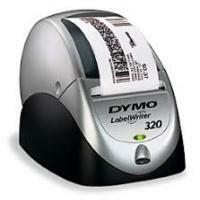 Q. I bought the Dymo labelwriter 320 just couple of days back. Would you please guide how do I perform a self-test for my printer? Q. As I regularly print labels for my business, I am looking out to buy a bigger Dymo labelwriter 320 label tapes multipack. Does your website have an option to by a bigger multipack? As I can't find any option in the list of label tapes given here. A. Yes. We do have an option to buy a bigger Dymo labelwriter 320 label tapes multipack on the next page. You can go for a compatible Dymo white labels (SO722540) multipack that consists of 5 packs providing 1000 labels each. The size of each label is 32mm×57mm. In addition we also offer multipacks consisting of 10 packs. Q. How do I add special characters and symbols using my new Dymo labelwriter 320? The dialog box for Symbols will show up. Please note that the symbol or character that shows up on the label will be equal to the text font size. Q. What is the shelf-life offered by Dymo labelwriter 320 label tape? A. In general, the label tapes come with a shelf life of upto 18 months.